Whatever the Douma residents, who had first-hand experience of the shooting of the ‘water dousing after chemical attack’ video, have to say, their words simply don’t fit into the narrative allowed in the West, analysts told RT. April 28 (RT News) Footage of screaming bewildered civilians and children being doused with water, presumably to decontaminate them, was a key part in convincing Western audiences that a chemical attack happened in Douma. Russia brought the people seen in the video to Brussels, where they told anyone interested in listening that the scene was staged. Their testimonies, however, were swiftly branded as “bizarre and underwhelming” and even an “obscene masquerade” staged by Russians. “They refuse to see this as evidence, obviously pending what the OPCW team is going to come up with in Douma,”Middle East expert Ammar Waqqaf said in an interview with RT. The alleged chemical incident, without any investigation, has already become a “solid fact” in the West, which the US, Britain and France based their “retaliatory” strike on. “These three actors were quick to do what they did, to bomb the place, because they knew they didn’t have a solid case. They wanted to bomb with disregard to whatever was happening over there,” Waqqaf stated. 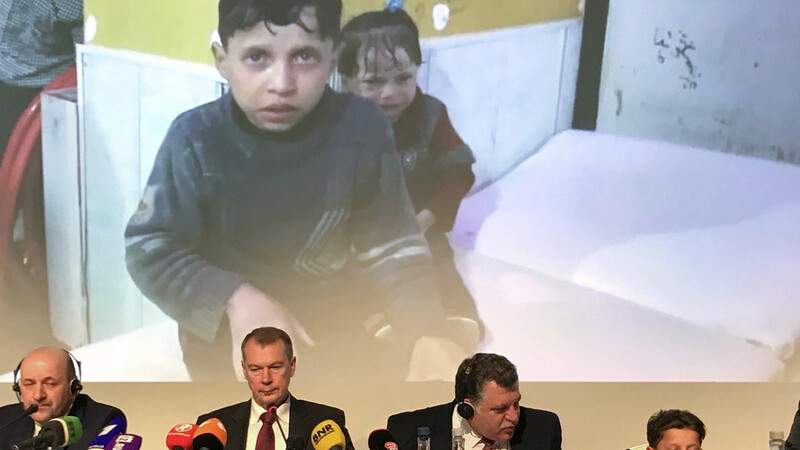 If the Organisation for the Prohibition of Chemical Weapons (OPCW) fails to confirm that there was an attack or even any chemical incident, it would be ignored or at least heavily downplayed, the former British ambassador to Syria, Peter Ford, predicted. “It will be either ignored or an attempt will be made to downplay and undermine it,” Ford told RT.